Behold & Reflect: Asking Myself: In what activities do you experience God's presence? Asking Myself: In what activities do you experience God's presence? This is the 28th post in my series "Asking Myself," in which I weekly ponder one question posed in Teresa Blythe's rich book, 50 Ways to Pray. You can find the start of the series here and last week's post here. The first nine posts focused on theological musings, while posts 10 to 25 prayerfully consider the specific questions Jesus posed in the New Testament. Posts 26 to present focus on Questions on Spirituality. 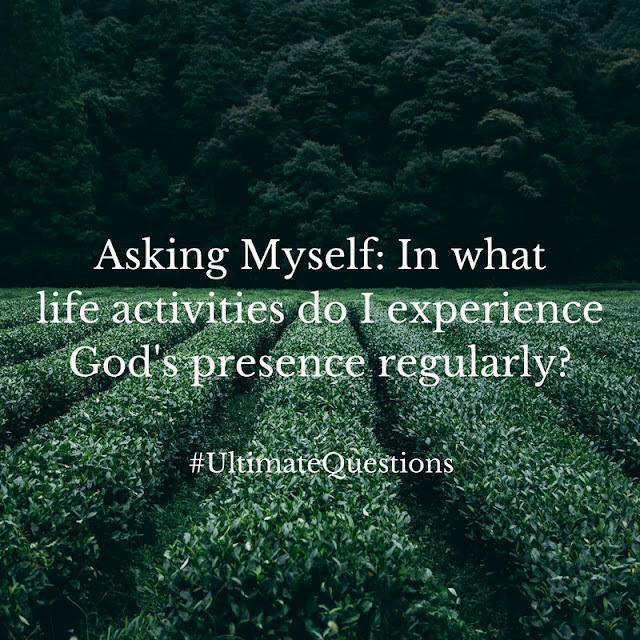 Q: In what life activities do you experience God's presence on a regular basis? Some of these questions are starting to sound a little bit similar, eh? But I think we need a lot of questions about God's presence in order to mine the depths of our experience. The emphasis here is on what routine, mundane or daily activities are spiritually charged. When do I commonly feel God is with me? 1. Journaling in my green chair. This is something I do almost daily, and can really get absorbed in if I don't watch the clock or am not interrupted by some small person or other. A friend commented recently that I'm not very handy with words in person, as in speaking what's on my mind. This is true. However, something about the pace of writing by hand allows my thoughts to flow naturally-- even articulately-- compared to my speaking pace. I feel as if I'm able to express my truest self-- and something even beyond myself--- when I write in my journal. It feels like a conversation with my Maker and dearest Friend. Or perhaps conversation isn't the best metaphor, because I don't mean to say that I hear a back and forth repartee. Maybe it's more like a convergence of thoughts, my mind with the mind of Christ. Sometimes my entry begins as an unloading of anxieties or ideas or wishful thinking, but once that's emptied out, I feel a clearer connection, a brighter sky between me and God. However the entry goes, journalling is for me about the surest way to find His presence. 2. "Working" in my garden. Perhaps because I so highly relate to God as a Creator, I really feel alive in His presence when I'm immersed in his Creation. I have, for most of my adult life, attempted to keep some kind of garden... be it dying potted plants on my Taipei balcony 15 years ago, or the tangled and sloppy little garden I have now, wedged up in an exterior corner of my house and entwined with netting to keep deer at bay. When I "garden" I actually spend a lot of time just looking at the plants and the microcosm they create. There's no conversation during this time. I'm just in awe. It doesn't matter how many times I've looked at the furry blueish leaves of sage or the hairy stems of my heirloom tomatoes or the smooth bud of a pepper just emerged from where a white flower once was... When I'm in cahoots with this menagerie, seeing things with my worm's eye, macro lense mind, it seems like the whole universe, for that moment, is at peace. Perfect peace. 3. Chatting with my kids in the car or at the table. My kids are so smart. No really, I'm not just saying this. I've got three future theologians and philosophers under my roof. "Mom. I wanna read God." "Mom, does God hate Satan?" "Mom, is Jesus Jesus's Father?" "Can there only be good if there is bad?" "After we die and we wake up in the fourth dimension will it seem like this life in the third dimension was just a dream?" I get all this and more while driving them home through rush hour traffic or trying to get dinner(s) for three very picky eaters on the table. My love for them and my sheer delight at the zany and sage things they say make me feel a kind of grateful simpatico with my mysterious Father, who must find us equally lovable and amazing, as only a parent can. And you? What are some of the everyday, repeated moments that make up your life in God's presence? Do you find these moments are part of the daily rhythm, or do you make an intentional choice to find Him in tried-and-true places? Next Week: In what activities do you feel blocked from God's presence?